Christian theologian of the second and third centuries; schismatic Bishop of Rome in opposition to Calixtus I. (217); deported in 235 to Sardinia, where he died. Hippolytus was one of the most prolific writers among the Church Fathers, the first real exegete of the Christian Church, and, because of his intimate acquaintance with philosophical and gnostic systems, one of the most prominent among the early defenders of Catholic doctrine. His works have come down in a fragmentary state and in various translations, Latin, Syriac, Arabic, Ethiopic, Armenian, and Georgian. In 1551 a statue of Hippolytus, made in the third century, was unearthed in the Via Tiburtina in Rome, on the pedestal of which was engraved a list of his many works, a list which is found with variations both in Eusebius and in Jerome. Hippolytus is of interest in several ways to the Jewish student. As a defender of his church it was natural that he should attack the Jews. His Ἀποδεικτικὴ πρὸς Ἰουδαίονς (on the statue simply Πρὸς τοὺς Ἰουδαίονς) was written to show that the Jews were themselves responsible for their misfortune and their wretched condition, because of their wicked behavior toward the Messiah (Caspari, "Quellen," p. 395). This treatise was much used by later anti-Jewish writers, and has probably not survived in its original form (Bonwetsch, "Studien," pp. 13, 19). In another work, the "Treatise on Faith," found by N. J. Marr in a Grusian manuscript in Tiflis, there is a further polemic against the Jews (idem, "Hippolyt's Kommentar zum Hohen Liede," p. 11, Leipsic, 1902). "They earnestly aim at serious habits and a temperate life, as one may ascertain from their laws. . . . The reader will find himself astonished at their temperance and the amount of diligence lavished on customs legally enacted in reference to man. . . . The superiority of their ritual it is easy for those who wish it to ascertain, provided they read that which furnishes information on these points." The same generous spirit is seen in the following chapter, where he speaks of the Jewish doctrine of the Messiah, which he gives clearly and succinctly, though naturally opposing it. In book x. he treats also of the Ebionites (ch. 18), and of Jewish chronology (ch. 26) as proving the antiquity of Christian truth. In various manuscripts containing an Arabic catena of the Pentateuch (ed. Lagarde, "Materialen zur Kritik des Pentateuchs," ii., Leipsic, 1867) there are extracts from "Hippolytus, the commentator of the Targum" or "of the Syriac," which are undoubtedly by this author. Jean Gagnier had already seen parallels in these extracts to such works as the Pirḳe Rabbi Eliezer and the targums of Onḳelos and Jonathan. What the word "targum" means in this connection is quite uncertain; and additions have undoubtedly been made in the course of time. As Lagarde had seen, the work is very much in the nature of a Jewish midrash, indicating the source from which many of the ideas have been borrowed (see Achelis, "Hippolitstudien," Leipsic, 1897). As an exegete, Hippolytus uses the allegory and the type, but in a moderate degree. He finds references in the Book of Daniel to Antiochus and the Maccabees. He admits also that the historical character of the story of Susanna is questioned by the Jews. 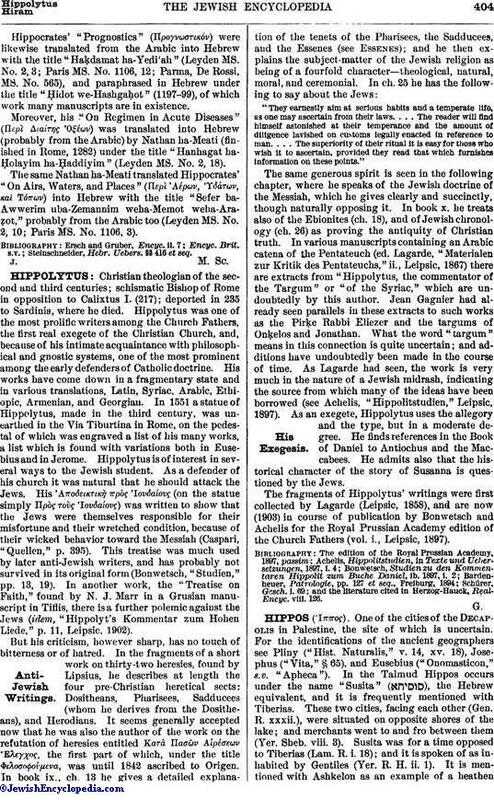 The fragments of Hippolytus' writings were first collected by Lagarde (Leipsic, 1858), and are now (1903) in course of publication by Bonwetsch and Achelis for the Royal Prussian Academy edition of the Church Fathers (vol. i., Leipsic, 1897). and the literature cited in Herzog-Hauck, Real-Encyc. viii. 126.